As per the announcement at WWDC 2013, Apple has just released its first Developer Preview of OS X Mavericks 10.9. In keeping with the nature of the past few releases, OS X 10.9 delivers a plethora of rather minor changes which, collectively, make for a pretty decent overall improvement. Details after the break! The pre-WWDC hype may have been dominated by talk of iOS 7 and the various alterations therein, but Apple’s efforts to maintain its very acclaimed desktop software cannot be ignored. Last year’s introduction of OS X Mountain Lion 10.8 saw perhaps the biggest statement yet that Apple is moving towards amalgamating its two biggest operating systems, with the likes of Reminders, Notification Center, iMessage and Game Center all making their respective debuts. Although quite a few traditional Mac users baulked at the perceived iOS-ification of OS X, the new additions – particularly iMessage – were generally well received, and this year’s OS X 10.9 follows almost the same pattern. One of my favorite elements of the OS X 10.9 announcement was the introduction of iCloud Keychain which will sync all your passwords and sensitive information to authorized OS X Mavericks powered Macs. It’s safe to say that the days of ‘remembering’ things are long gone with this release. 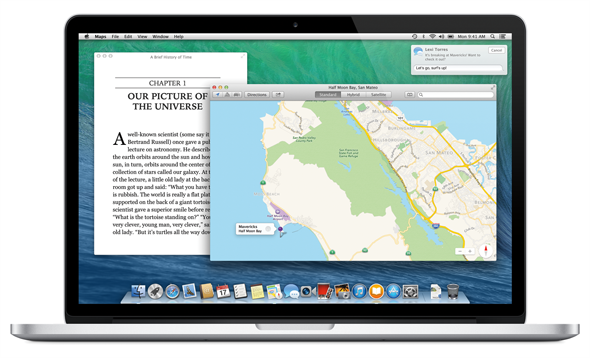 Furthermore, Mavericks also brings to the roster iBooks, Maps, Calendar and a ton of other new enhancements, which you can check out first- hand after downloading the official Developer Preview. So, if you’re a registered Apple developer and would like to give OS X 10.9 a trial run on your Mac, you can now do so by heading over to the Mac Dev Center right now. As well as giving you an insight into the future of OS X, beta testing provides an opportunity for you to find lingering bugs, and should you report them directly to Apple, you’ll also be helping the overall progress of the product as it edges towards the end-user. You must be a registered developer in order to try the beta out, and if you meet this prerequisite, give it a download. Oh, and be sure to let us know how it runs for you by dropping a comment via the usual mediums below. Also, will you be switching to OS X Mavericks when it’s available? Or, are you good with OS X Mountain Lion for now?